I wanted to share 5 recipes with you that we have tried over the last couple of weeks. After starting a ‘meal ideas’ board on Pinterest I thought that I had better start working through some of them. We quite like trying new things but both Adam and I can be a little fussy. He doesn’t really like any vegetables apart from carrots and peas. I can’t eat prawns or a lot of peppers because it upsets my tummy! Recently we have just been recycling the same recipes over and over because we like them. But, we had decided that we wanted a bit more variety. These are the ones that we have tried, loved and will be eating again! They all made enough portions for 2-3 meals so we still have some left to eat in our freezer. I would love to know if you have tried these already or are going to try them. 1. 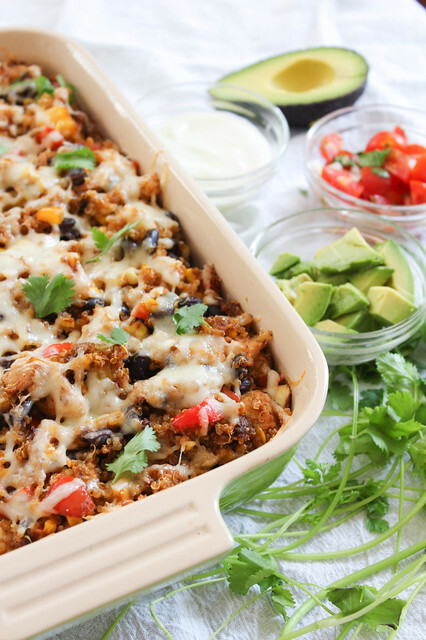 Tex Mex Chicken Casserole from Bites of Bri. This was really easy to put together and right up our street as we love Mexican food! I couldn’t find Quinoa in the shop so opted for tiny pasta stars instead. I didn’t use peppers, corn or avocado but added a tin of chopped tomatoes. The smell of the Pico de Gallo was amazing and we used it on the top of our dish, beneath the layer of cheese. 2. 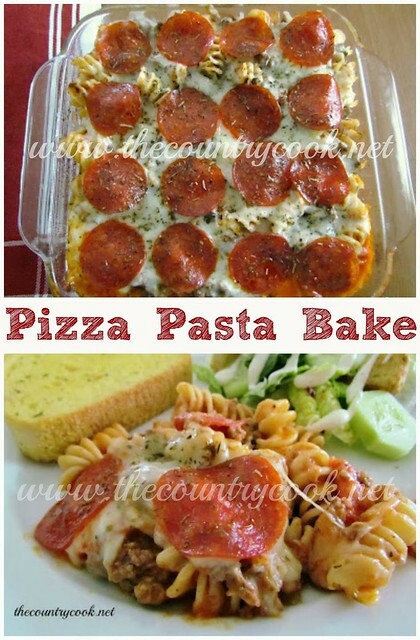 Pizza Pasta Bake from The Country Cook. This did taste just like a meat feast pizza! We ended up using chorizo instead of pepperoni as I couldn’t find any in the shop! I’m am still getting used to American supermarkets. One day, I will do a shop where I get everything on my list! It took me ages to find the cilantro for recipe 1 as I am used to calling it coriander! 3. 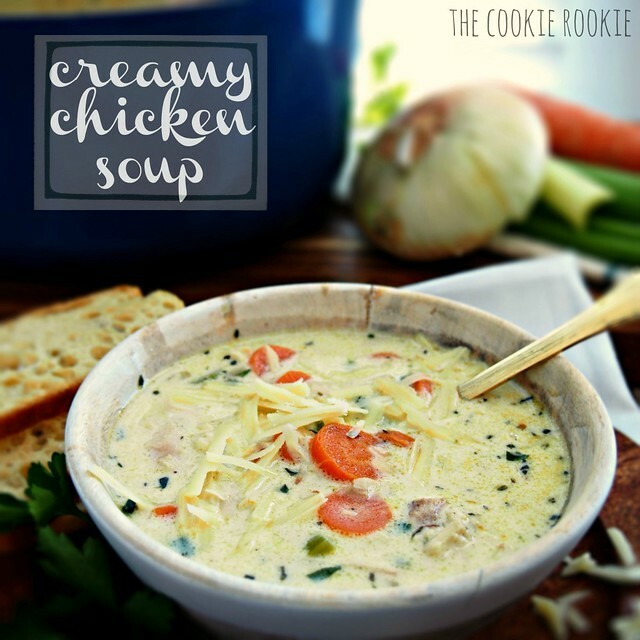 Creamy Chicken Soup from The Cookie Rookie. I LOVED this soup. So hearty and filling. Plus, it made enough for 3 dinners; we tried the suggestion of having it over a jacket (baked) potato too! Adam turned his nose up at the leeks but they were hardly noticeable after they had been cooked. He didn’t moan about them when we were eating it either 🙂 The only thing I didn’t include in this was the wine. I like using wine to cook with but don’t like drinking it so thought it was a bit of a waste to buy a full bottle! 4. Meatball Sub Casserole from The Country Cook. I was very intrigued to try this as I have never heard of putting bread at the bottom of the casserole! However, it was gorgeous as the bread soaked up all the flavours in the dish! I made my own meatballs using some herbs that I had in the cupboard; that was probably the hardest part of making this! It would be super quick it you used frozen or ready-made meatballs! 5. 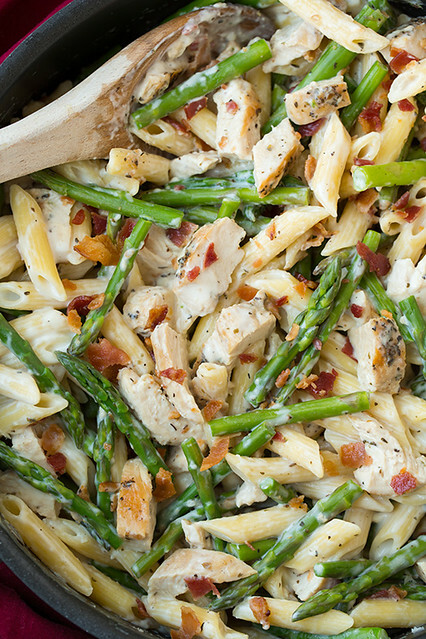 Creamy Chicken & Asparagus Pasta from Cooking Classy. We had two firsts making this dish! I have eaten but never cooked asparagus…Adam had never tried it! … and we used turkey bacon, which I have never eaten before! We have found that the normal ‘pig’ bacon has loads of fat on compared to what we would normally use in the UK. We had tried some applewood smoked bacon and it was very tasty, but we ended up crozzling the fat so much that it set our fire alarm off! Not good in an apartment! The turkey bacon was just as tasty and cooked without smoke too 😀 We ended up adding some mixed frozen veg to this at the last minute. Mainly,to add a bit of colour to Adam’s portion if he didn’t like the asparagus. Well, he liked it to start with but then gave me some of his! Progress? They all look yummy! On the pepperoni, you might try the end caps. Our store puts the pepperoni at the end of the frozen dinners aisle, even though it’s not frozen. (They also put the peanut butter next to the coffee–why, I will never understand.) And I agree with you on the bacon–the UK version is much yummier. We traveled to the UK back in 2010, and we both love the bacon. Legs’ breakfast of choice during our week in Scotland was the bacon bap! Of course, Legs will eat a pound of American bacon at a sitting, so that’s not such a surprise. Aaaahh, that’s a good tip… I will look there next! The turkey bacon wasn’t bad but still not the same amount of meat UK bacon has. Bacon baps are yummy…though I would call it a bacon cob. There are loads of names for a bread roll in UK depending on where you are from… bread cob, bread cake, bread roll, bread bap, barm cake….the list is endless and can cause quite a debate! haha! Yes, we noticed that. Scotland was decidedly in the bacon bap camp. But it was a bacon butty in Yorkshire, which is the only other one I remember seeing. Firstly, I’d like to submit a request for some veggie-friendly recipes to be featured in your next foodie post 🌽🍅🍆 But other than my fussiness, all of these recipes sound tempting. I am wondering whether the Mexican casserole in particular could be adapted using Quorn, as I too love all things Mexi. I’m even contemplating some sugar skull fabric when I find a print I like with a price I approve of! I did think of you when I was reading this post as I am sure that they would all be things that you and B would like! I’m sure that you could substitute all meat listed for quorn alternatives – do they even do quorn meatballs?